I am not always entranced by new ways of doing things, or new technology. I am resistant to the lure of novelty. I am often fatalistic about people’ slow adoption to change. But sometimes, it is obvious that a different way of doing things is simply better. Why does it not always take root? Test case (sorry to those who have heard it before): Peeling a Banana. When I was young, I was taught how to peel a banana. It consisted of grabbing the stalk, and tugging at it until the skin split away. It was sometimes a bit tricky, and occasionally squashed a very small section of the banana. But it was all I knew. I was happy. One day, someone showed me how monkeys open bananas. (I think it was Ben James at BBJ, himself a fairly simian character). Being generally respectful of the survival skills of the animal kingdom, and particularly enthusiastic about monkeys, I was intrigued. 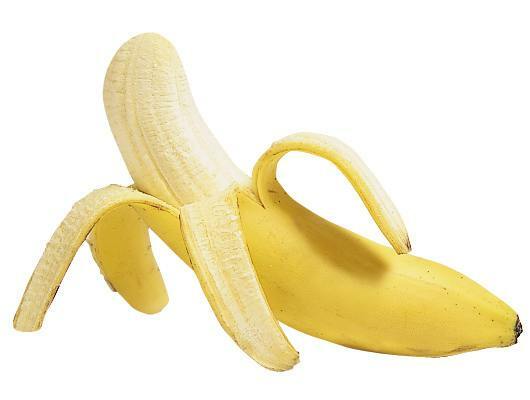 A monkey opens the banana at the other end, making a tiny incision in the tip and then splitting the skin open. It is much much easier. It is less likely to bruise the banana. And the stalk acts as a neat holder, allowing you to easily eat all the way to the end of the flesh. It is, in summary, simply and obviously a better way of eating a banana. I know, from a third of a lifetime pursuing the noble goals of helping people to get more out of their relationship with bananas, that I am not alone. Several people have responded positively to my peeling demonstrations. And I am not alone in fighting the good fight. I found this explanation clear and helpful. 2.3m people have watched it. Hopefully some of them were converted. But not all of them. Why? When something is so obviously helpful, even on a topic of so little real pain, why does it not always take root. 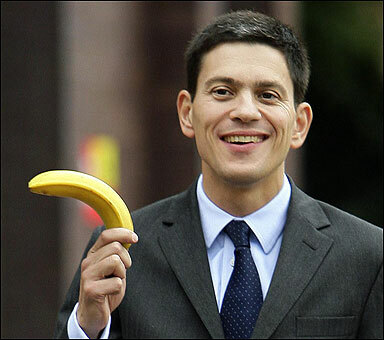 No man who holds a banana in such a monkey-like fashion could possibly be a better Prime Minister than Gordon Brown or David Cameron. Oh. All of the people who I have managed to persuade are the kind of people who like monkeys. Who don’t baulk at thinking of human beings as crazy monkeys, rather than divine imitations. But obviously this isn’t everyone’s cup of tea. 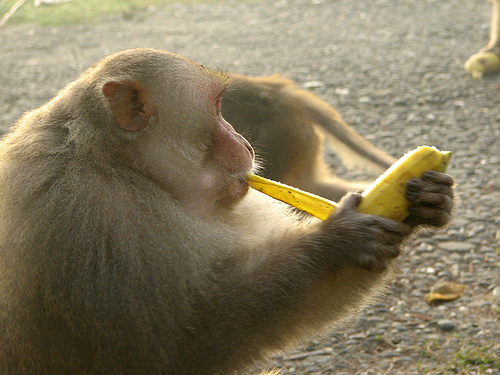 Is it fear of being like the monkeys that is holding back banana-peeling innovation? Is it, in fact, our entrancement with our own evolutionary progress that prevents us from embracing this obvious piece of progress in the peeling of fruit? Does the fear of being looked at like a monkey outweigh the small trace of inconvenience that comes from changing your line of attach? For me, this is the obsession that won’t go away. Please help me by at least trying to peel your banana like a monkey. I’ve given this a go for the last two mornings when I’ve had my daily banana and I’m almost converted. I’m going to give it a go in front of other people and see if I get any comments! The only thing I don’t like is the little black thread that you get (at now the top) of the banana when you first peel it. You can see it in the yutube clip too. I had bad experience when I was a kid of nearly choking on one of them so I have a fear of them now and avoid it at all costs! The only way I know is how the monkeys do it (I didn’t know before that it’s a monkey thing). And I see people around me doing the same way. I’m from India, by the way. INTERESTING! In both the UK and the USA (and I think in many other parts of Europe) it is follishly very much the norm to start at the stalk end. I am reassured to hear that large parts of the world’s population are already accessing their bananas in the optimal fashion. I am going to have to dig further into the history of this global divide. Thanks for reading, and for commenting! +1 to what Richard Elliot said. The “bottom” of the peeled banana has this little unpleasant black nub. When I open it from the stem, I stop eating right before that yucky morsel and dispose of it with the peel. So I’m on the fence about which method is better overall. I’m from the US and when I was in grade school my best friend told me that monkeys open their bananas from the bottom. Being a very conscientious child, I believed that if monkeys open bananas from the bottom it must be the right way to do it. So for almost the last two decades, I’ve opened my bananas from the bottom. On my first cruise I saw a banana listed on the breakfast menu and wondered how they would serve it as everything was so fancy in the dining room. Didn’t order it, but saw it come out, nestled in a white cloth napkin, with one strip of skin removed off the top, the banana cut into slices & left in the “boat”. Perfect. it’s amazing how badly you fail at opening a banana. even that poor imbecile in the video. I’ve NEVER had a problem opening a banana! what is wrong in your simian mind that you utterly fail at opening a banana?! you squeeze the end. SQUEEZE. squeezing causes pressure and bruising. and then you have the most disgusting part of a banana sitting on top for your first, ape-like bite. peeling a banana stalk first is easier. less messy. no squeezing. and guess what?! the peel is on it the entire way through so you can hold it just fine. lastly, as you take your final bite this way, you can leave that disgusting, sometimes crunchy part at the end for the prototype humans you so love. It’s a little arrogant to assume peeling from the bottom is some how easier or better. Why not just let people eat bananas the way they want to, and leave all the fuss for something important? I’ve peeled both ways, I prefer the Top-Bottom Approach and I get along fine with the way I peel. If anyone has as much trouble as the guy in the video does, then maybe the Bottom-Top approach is for them – but it certainly isn’t for me. I’ve been peeling bananas upside down for years now. I can’t remember how I learned to do it. Either somebody told me or I watched a video. Either way, I have no shame when it comes to doing it in front of people. And as far as that little black bit on top, I just pinch it off and toss it with the peel! This is a very stupid argument. Neither way is better! I had to start eating my bananas FROM THE MIDDLE because thee is always one jerk nearby who will criticize my banana eating method. I am appalled that people would be so partisan that they would not let me eat my banana in peace.